With winter weather on its way, many of us have already gone through and gotten our homes ready by doing such things cleaning our gutters. While you’re doing up on the roof, though, have you ever wondered where the idea for gutters came from? 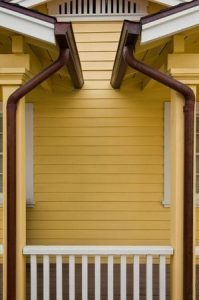 If you have, here is a short history lesson on the origin of gutters. It all started back in ancient times when the need to collect rainwater for drinking and channel water for irrigation arose. Using wooden gutters, rainwater would be funneled into barrels for bathing, washing and watering crops. These early gutters were originally made from old growth cedar, notes Gutters.com, but the supply of it started to run short. This caused builders to instead turn to using new cedar or hemlock wood lined with zinc that helped the gutters last longer. In the 20th century, steel became the material of choice for gutters. With a much greater strength and resistance to rotting, steel was a preferred choice – at least for a few years. Following World War II, aluminum became much more widely available and became the primary material for gutters due to its light weight and durability. Aluminum gutter production really took off in the 1960s with the invention of seamless aluminum gutters. Using a specially developed machine that held a roll of aluminum at one end, continuous gutters could be quickly produces in a variety of lengths. This made designing perfectly fit gutters a much simpler process and led to many homes adding these new, affordable gutters. In fact, these reliable gutters were so popular and durable that descendants of the earliest seamless gutters are still installed and in use at more than 70 percent of homes today. Whether you need a new gutter installed or your existing gutter repaired, the team at Roofing By Bruce can help. For more information on our gutter installation and repair services, or any of our other roofing services, give us a call today at 570-424-7250!